A yellow warning of heavy rain for parts of south Wales was in place on Monday evening, with gales are expected across the country well into Tuesday. 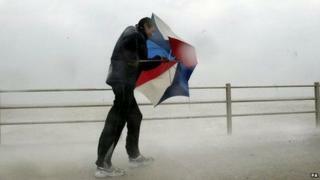 The Met Office said gusts of 40-50 mph were expected, but they could reach 60-70 mph across exposed Irish Sea coasts. One lane was closed on the M48 Severn Bridge in both directions due to the poor conditions. Trees also fell, blocking roads in Powys and Carmarthenshire. Firefighters in Swansea were called to Mount Pleasant just before 19:15 BST after a tree fell onto a car. No-one was hurt and the tree has since been removed. Natural Resources Wales said there were several flood alerts in place across Wales. The weather had the potential to cause disruption to transport and outdoor activities and damage to trees was likely, the Met Office said. Large waves will affect some coasts in the west at times. Areas likely to be affected by heavy rain include Caerphilly, Rhondda Cynon Taff, Bridgend, Cardiff, Vale of Glamorgan, Neath Port Talbot, Merthyr Tydfil and Blaenau Gwent. The gales are likely to affect these areas and also Carmarthenshire, Ceredigion, Conwy, Denbighshire, Flintshire, Gwynedd, Isle of Anglesey, Monmouthshire, Newport, Pembrokeshire, Powys, Swansea, Torfaen and Wrexham.